I’m gonna keep this short as possible since this film doesn’t deserve a full write up snd truth be told by even writing anything about this film i wasted even more of my time. I don’t hate all remakes and while I think after a while it gets tiresome even more so when many are so inferior, but my hate of this film has nothing to do do with that. The fact Night of the Living Dead is in the public domain any hack can make their own version and Jeff Broadstreet is the hack in question and this guy needs to get kicked in the nuts. He obviously learned absolutely nothing from watching the original and the original is actually shown during the film with characters watching it on TV I assume this was meant to be a homage and to be funny. It wasn’t. It was stupid and the best parts of this movie are clips of the original being shown. This film is a complete insult to George Romero and the legacy of Night of the Living Dead. Also seeing how NOTLD was already remade in 1990 one has to wonder why there was even a need for this garbage? Its movies like this that gives the horror genre a bad name. Back in the 70s and 80s zombie films were quite popular before fading away for quite sometime until Shaun of the Dead played a part in bringing them back and this film makes me wish zombie movies stayed dead. 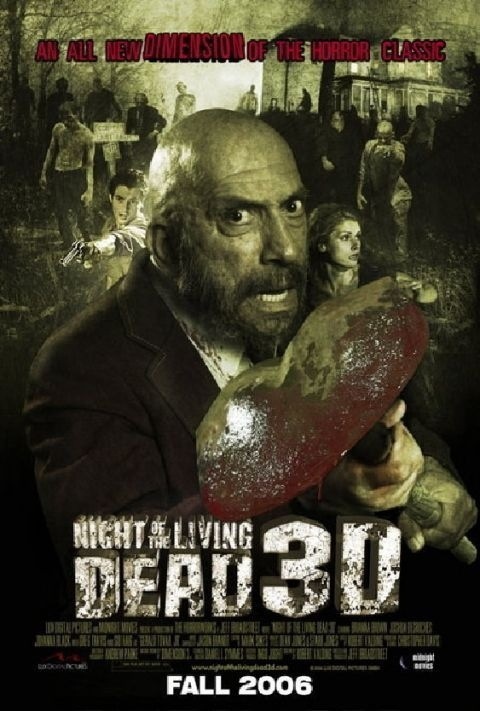 Sid Haig back in the 70s appeared in many exploitation flicks and as the tide turned on these movies Haig managed to go on, but it wasn’t until House of 1000 Corpses he really made his comeback and my question is how did the makers of this garbage land him? Unless it was blackmail I can’t see any other reason. 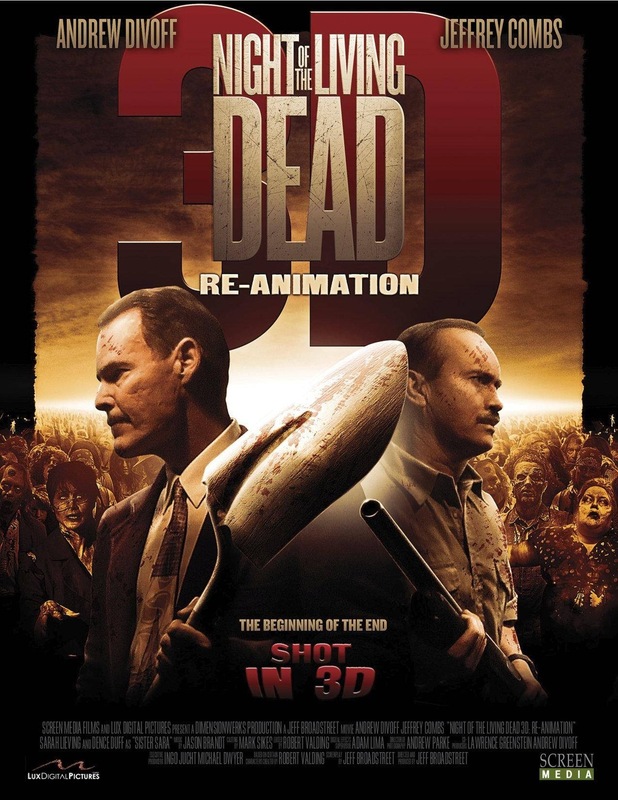 Night of the Living Dead 3D is pathetic and Jeff Broadstreet nothing but a hack who really needs a kick in the nuts. The only positive thing I can say about this trash is it can be fun to sit back and make fun of sad and pathetic of a film it turned out, but there are plenty of films out there that work on the so bad its good level. This isn’t one of them. As bad as Night of the Living Dead 3D was its a masterpiece compared to this pile of trash called a film. Jeff Broadstreet clearly doesn’t know a thing about filmmaking and its quite sad there are people out there with actual talent that never make it in the industry while this idiot gets to make films for a living no matter how low budget or little seen. If Broadstreet’s goal was to piss all over Romero’s film he succeeds in that. I’m not even gonna waste my time getting into the plot since the film doesn’t deserve any more attention than I’ve given it. I’ve seen a lot of bad films, watched movies by bad filmmakers, but Jeff Broadstreet just might be the least talented filmmaker to ever make a motion picture and this guy makes Claudio Fragasso look like Martin Scorsese. What’s truly amazing is he some how got Sid Haig in this first and here with the sequel he lands Andrew Divoff and Jeffrey Combs. Either they needed the money, were blackmailed or tricked into agreeing to star in this waste of a film. And Divoff actually has a producing credit! There is also a lame attempt at social commentary with rather than FOX News the station is called Fixd news and we have a character called Sister Sarah who looks and sounds like Sarah Palin. The social commentary is silly and laughable and here’s a tip for Broadstreet; just because you remade a Romero film doesn’t make you him so lay off the social commentary cause it just comes out as a hack filmmaker trying to be funny. The zombies are lame looking, the deaths even lamer. This is as bad as filmmaking as you will find. The film moves so slowly as nothing really happens until the end and the dialogue so bad and not even in a good way make this film total boredom. One scene has a charcter mention the events of Romero’s first 3 Dead films as well as the Savini remake. I assume it was meant to be funny. It was wasn’t all it did is remind me I could be watching way better films at the moment.